A great back yard spot for the kids to pretend they're spending the day at the beach! 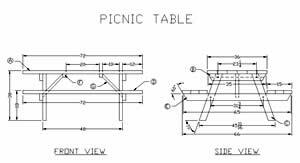 There isn't a lot a detail in this free woodworking plan, but its just another example of a picnic table design that may be useful if you are designing your own. Lee's Wood Projects - How to Build a Wooden Picnic Table.This is a practical project that the whole family can team-up to build. The western red cedar's beauty and durability will ensure countless days filled with picnic barbecues and outdoor parties. Here's a great free woodworking plan of a garden arbor that has bench seating on each side. The California Redwood Association has designed this free woodworking plan, that comes with a material list and a 3 page PDF that will show you the construction steps.